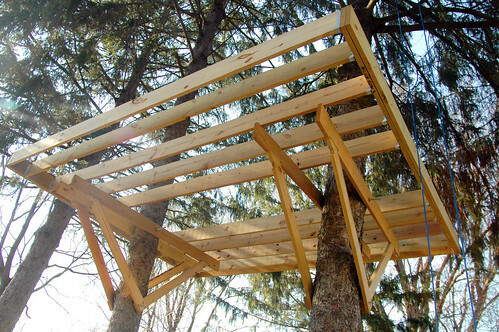 an update on The World’s Most Awesome Treehouse(s)! well, i thought i was going to make a little progress over the winter since odin inspected progress on The World’s Most Awesome Treehouse(s) but it turns out that heaving floor joists up a ladder in the ice and snow always ended up being last on my list of things to do. hi. ho. the good news is that it stayed up all winter! now that the weather has finally turned a little warmer i’m raring to get back to it and have almost all the floor joists up! just two more to go which will be a little tricky since i need to create cripple joists around the trees. but not too tricky. and then i can start putting in the decking, a guard rail and balusters so it’s safe enough for odin to run around and even pitch a tent and sleep up there while i’m designing the treehouse. i have to admit that i’m pretty excited about how the 14’x16′ deck in the sky is turning out! and even more excited at how sturdy it feels even in strong wind gusts. after i’m done, maybe i should make a little video along the lines of the “lollipop fort of death”? Pingback: snowdeal.org - thinking about getting into kite aerial photography with odin. Pingback: snowdeal.org - almost ready to put on the decking on The World’s Most Awesome Treehouse(s)!